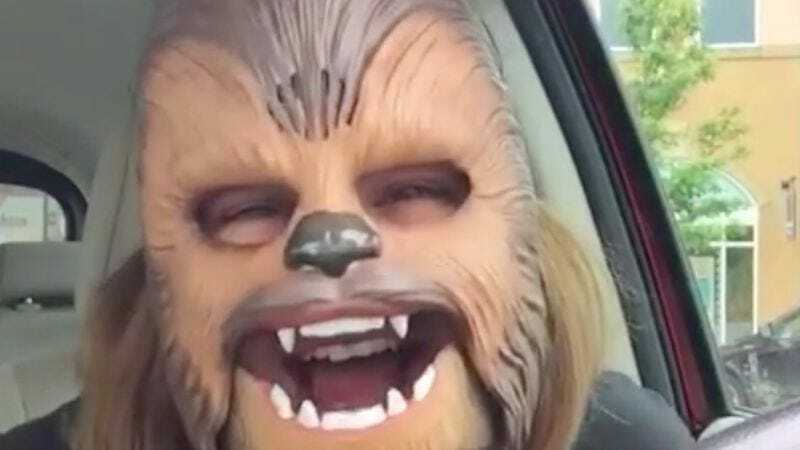 A video of a Texas woman gleefully donning a Chewbacca mask in a Kohl’s parking lot is the internet’s latest viral sensation. Candace Payne, the aforementioned woman, was already clad in a Death Star T-shirt when she bought the mask, which she just couldn’t wait to get out of the box. She started broadcasting the unboxing live from her car on Facebook, and as of this post, almost 40 million people have watched the clip, which is full of pure, unadulterated Star Wars nerd joy. While Payne is a joy from start to finish, things really get going with about 2:20 remaining in the clip. While she says she’ll let her children, Duncan and Cadence, play with it, she insists the mask will live in her room—no doubt along with the dozens of other Star Wars items she’ll surely get during her inevitable Ellen appearance in a week or two.